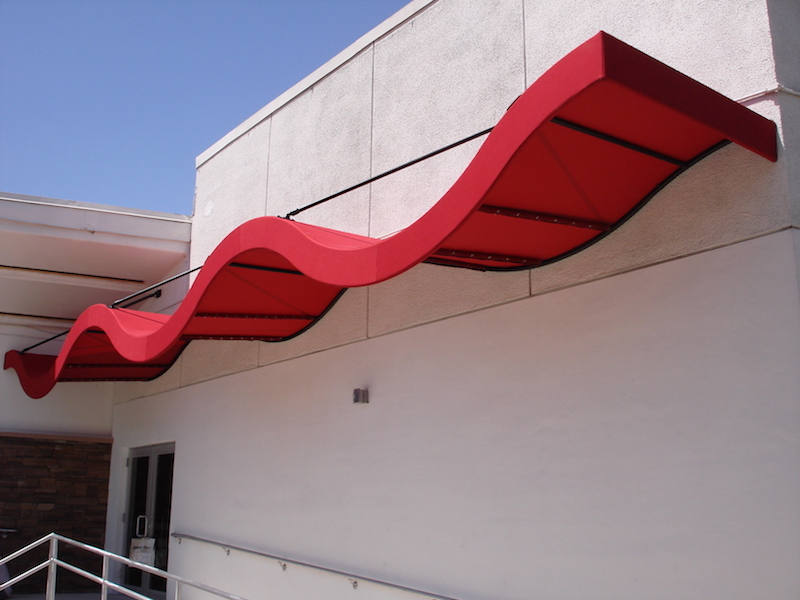 Awning fabric is generally standard within the industry, meaning that most every awning company offers the same fabrics and does not hold a proprietary line. While each has their pros and cons, they are all equally great fabrics and will withstand the harshest of climates. All fabric types have good abrasion resistance and will generally last between five to 15 years, depending on quality of fabric, exposure and proper fabric care. 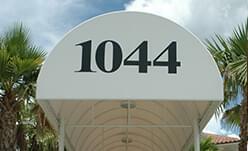 These vinyl fabrics are ideal for and back-lit applications printing graphics, meaning that signage on your awning will be displayed day and night. The translucent quality of back-lit vinyl fabrics allows lighting placed inside the frame or behind the fabric to transmit through the signage area, without being impeded by shadows from the framework. Like other vinyl fabrics are strong, waterproof and stain resistant. Polyester based fabrics or Vinyl-laminated Polyesters are strong, quick-drying, and tend to have wrinkle resistance and crease retention both wet and dry. Some vinyl-laminated polyesters, fabricated specifically for backlighting, are highly translucent. Fabrics meant for standard uses are more translucent depending on their color (Lighter colors are more translucent then darker colors). Vinyl-laminated Polyester fabrics weigh between 16-24 ounces, are resistant to UV light, mildew, water, and are recommended for use in areas of sustained high humidity. 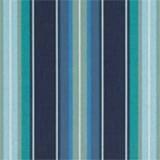 Polyester based fabrics are available in solids, stripes and custom patterns. Standard warranties range from five to ten years. 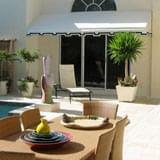 Shade mesh and other mesh fabrics are versatile and dependable. These fabrics are typically used for screens and shade sails. Quality mesh fabrics are UV, mildew and water resistant. Mesh fabrics are ideal for various sun protection applications. Cotton, or commonly referred to as cotton duck, is a heavy plain woven fabric. Although not commonly used nationally for awnings today, cotton duck is extremely durable and excellent in cold weather climates on smaller scale projects. Cotton duck is strong and flexible with unique self-contouring characteristics. It is water and mildew repellent. Standard warranties range from three to five years.